Series of 14 paintings created for my solo show "Omoiyari" at the Scottish Storytelling Centre in Edinburgh, 6th-27th July 2016. This is a personal exploration of where stories come from. All the paintings and drawings are gathered in a limited edition book, which includes a little tale about the village of Omoiyari and its people. More about the book here. 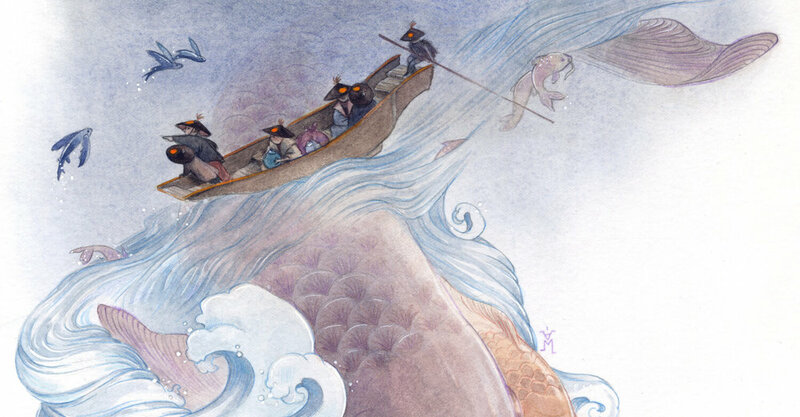 Hortari is a collection of 15 illustrated short stories about explorers and seekers you've never heard of. Bascahil Pellin, Isha Nim, Paul Teribec, Taherih Saffarah... they can't be found in history books, but I believe their story deserves to be told. To learn more and order a copy of the book. Illustrations and binding for the novel ‘Howl’s Moving Castle’ by Diana Wynne Jones, selected in the longlist for the Book Illustration Competition 2019, organized by The Folio Society and House of Illustration. The Book of Anetẓar is a limited edition artist book inspired by the art of Persian miniature paintings. You can learn more about the book here. The artwork is available as a limited edition print embellished with gold, or as a regular print, both pictured here. Watercolor and gold ink on paper. Design of a squirrel monkey, Saimiri. Personal work. Illustration inspired by Slavic folklore, created for a tutorial published by Graphite Magazine (issue 9, Oct. 2018). Domoy means "home", "homeward" in Russian. Series of illustrations (4 in total) published in the January 2017 issue of French magazine Tétras Lire, to illustrate the Peruvian tale of "El Choclo, l'or de Cuzco". Watercolor and pencil on paper, 2016. Illustrations and binding design for the Adventures and Memoirs of Sherlock Holmes by Arthur Conan Doyle, created for the Book Illustration Competition 2018. Longlisted by the organisers : House of Illustration and The Folio Society. Selected artwork from "L’Odyssée de Kumiko", a Japanse fairytale by Nancy Guilbert published in France by Gautier Languereau, November 2018. Selected artwork from "La princesse grenouille", a Russian fairytale retold in music by Elodie Fondacci and published in France by Gautier Languereau, October 2017. Series of 11 illustrations (including cover) published in the December 2017 issue of French magazine Tétras Lire, to illustrate the story "Les Patins d'Argent" (Hans Brinker, or, The Silver Skates) by Mary Mapes Dodge.